I am tracking the progress of Book #3 of A Resurrection of Magic. NO spoilers will be posted. I promise. The city of Limori is tense this morning, on the edge of something I can't predict. The magistrates--mostly descendants of the old royal families--are hiring guards and training them to fight. The merchants--including Hahp's father--see an opportunity to break the stranglehold of the magistrates control, their laws, their fees. The wizards are not what they seem to be. And the Eridians are learning that their beliefs are based on one girl's fears, and her genius, and her love. Everything in this picture has a story. The sugar bowl was my Aunt Mollie's. The button jar took twenty years to fill. I bought the bracelet from a beautiful Apache woman on a train in New Mexico. The lovely blue paperweight is a gift from the fabulous http://www.bluewillowbookshop.com/ I found the carved deer bone in Colorado when I was ten. I heard my horse's hoof click on it as we scrambled up a bank, caught a glimpse of the shape. So I tethered my horse to a willow tree and slid back down to look. Sadima has found something this morning, something that scares her, and gives her hope. It's getting harder to make sure there are no spoilers. The book is about 2/3's finished so everything is becoming more tense, tighter, harder to talk about without actually talking about it. I can tell you this: there will probably be some kind of bloodshed soon. Afternoon shadows on my phytolacca dioica. The trunk is nearly six feet wide now. Every part of this tree is poisonous: leaf, root, bark, flower and seed. It reminds me of Somiss: amazing and deadly. Hahp has done something he didn't think he *could* do. I am wondering if he can live through it. If he can't, everything changes. Writing involves every part of me and I am sitting here crying. I hate the wizards. I understand them--I do. But I hate them. If you could fly high enough, the wind sifting through your fingers, your hair tied tight with a thread from the hemline of your robe, Limori would look like this tonight. The bonfires, the torch runners, the lanterns on the carriages as people try to get out of the city. I have been reading research the past few weeks, mostly about ancient civilizations. I am trying to understand Limori better, how every set of rulers, every war, marks every generation that follows it. 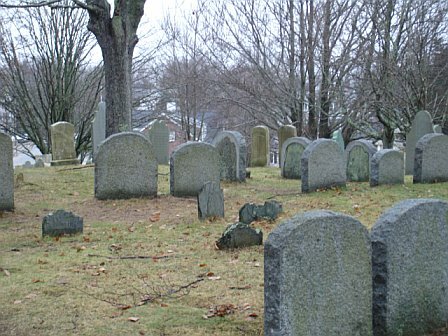 A colonial graveyard in Boston. Most of the inscriptions are too weathered to read. There is a much older graveyard near Limori, next to what is now Malek Park--Hahp's father bought the land and couldn't care less about the history that lies in the ground. Sadima hid three keys there once, and now has them back. She is trying to remember what doors they open. She can't remember that she never knew. Late last night, Hahp heard a voice I thought he would never hear. This is getting so strange. It always feels like the characters lead me along, now it feels like they are dragging me away from what I thought would happen toward reality. Their reality. This morning two characters will meet ....two people I thought would never meet... I have no idea what I will do if one of them doesn't survive the meeting. I am afraid to finish the scene. This was taken out a train window and the human brain follows the laws of motion to blur what is close and make it easier to see what's in the distance. Staring out train windows is apparently a lot like writing a novel. I woke up with the ending in my head. I have a lot to write to get there, and I am sure it will change as the characters live through it--and it is off in the distance and blurry. But I can see it from here. I can. This tree is on Oahu, Hawaii, in a botanical garden filled with odd and amazing trees. 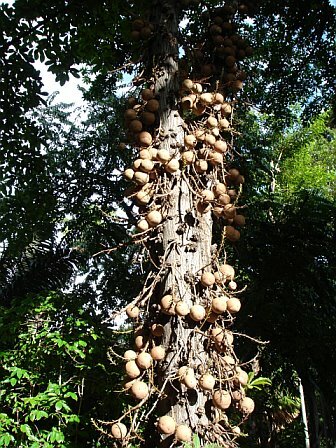 I didn't write down the scientific name...but the common name is "cannonball tree". There was a warning sign, telling people to stand back. So I was respectful and quiet, and can tell you that the fruits are huge, heavy, smooth and that they smelled--impossibly-- like vomit and a strange, distant, perfume. As I walked away, one of the fruits fell--on the far side of the tree, nowhere near me, and I had this tiny moment of feeling like it meant something, like the tree was telling me it could have hurt me, but hadn't. Sadima feels that way this morning. Like she has been warned, but also spared. There is a boy who has been fighting for years just to stay alive. He is hiding, standing in the dark, holding his breath, wishing he'd had the courage to jump into the deep water six years before. He almost wants to be found. He is longing to end the fight, to stop the fear, to put down the double-edged knife of hope. I have no idea what she is going to do--or not do. She has a reason to live now, though, and that changes everything. 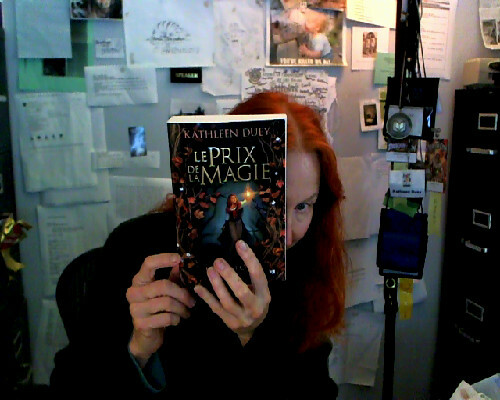 This is me, hiding behind the French edition of book #2. My series title is : A Resurrection of Magic. Their title for the trilogy is: The Price of Magic. We are both right. I stopped writing last night in the middle of a scene because I wasn't sure how Hahp would react to something. Prisoners who have been kept against their will for years carry their fear and rage in different ways. Hahp has, for most of his time in the cliffs, blamed his father. That's changing and I need to understand why, so I hope he will tell me. I know this much : his feelings, his reasons, aren't simple. They are tangled, barbed. I am not at all sure he will tell me the truth...or if he will talk to me at all. In the city of Limori, like anywhere else, the people who have read the history books understand things people who can't read never will. Over almost 200 years, Somiss has stolen, bought, preserved and studied almost all the books the royal families once owned. He will not make the mistakes the ancient wizards made. This is a little tangle of barbed wire I dug up in the garden. In Colorado, it was common, a leftover from the range wars. Farmers used it to keep free range cattle out of their corn. The cattlemen cut the wire every chance they got. It was a small, strange war to settle who owned the land that had been stolen from the First Nations--the people who came here from other places many centuries before Spain decided to colonize Mexico, before Englishmen sent their second sons to a new world to make a fortune from slave labor. And all of this happened thousands of years after the incredible building that eventually became the Pantheon was built in what eventually became Rome, Italy. History is always shameful, sometimes glorious, and always still in progress. People who have have impacted each other's lives for over two hundred years are standing in Market Square about 30 paces from each other--and they don't know it. The wind is rising and rain is starting to spatter. The South Enders know it's time to go home, but they can't. They just...can't. I am trying to stand close enough to peek over their shoulders so I can see what they see coming from beyond the trees. . This tree lives in WI. You can tell it loves the wind--and fears it. I know these entries are getting farther apart. I apologize. I am living in Limori now, barely coming up for food and water. I am on Chapter 64 and holding my breath because the characters I love best are all in danger. The city is full of anger and blame--almost none of it aimed at the real source the problem. The sky, seen through a Giant Bird of Paradise tree, There is a rat's nest on the right, and an empty bloom sheath on the left. I could smell the flowers still, a little, but the rat-stink was much stronger. Today in Limori's South End streets, Sadima heard a shout behind her. She recognized the voice, but she didn't look back. She didn't walk faster or slower and she didn't try to hide....she just kept walking. Sometimes that's all you can do. This is my Euphorbia. It's a succulent, not a cactus, but the thorns are about 2 inches long and needle sharp.The white sap is milky, caustic, and poisonous. It drips out of even the smallest scratch. The plant was about two feet tall and a foot wide when I freed it from its container and introduced it to real dirt. It has grown slowly, relentlessly. It's well over six feet tall and at least six feet wide now. If I wanted to take it out (I don't, but if I did) it would be almost impossible. It intends to take over the world. How did I not see this coming? EDUCATION and the AMERICAN DREAM. As long as six years ago, speaking/appearing in schools, I began to hear about librarians being fired. Schools with no trained librarians became the norm in some states--or there might be one librarian serving 6-10 schools, spending half the day driving. EDUCATION is being gutted to meet budget cuts. Do we want to create a low wage-earning underclass? Because this is how you do it. You make education--even a self-guided/public library education like my own-- harder and harder for people of limited means. You take away the level playing field of good public education. You let the universities charge fees very few can afford. This dismantling of public education and public libraries is underway and growing. And it is the the worst betrayal of the American Dream I can imagine. Please, look into what your own state is doing and make some noise. If we don't, no one will. 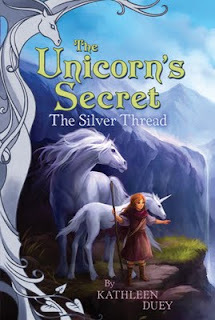 I have been blogging about the writing process of A Resurrection of Magic. It's a trilogy.Two books are available now. I am writing the third one while you read these words... If I am not asleep. A Resurrection of Magic is two stories that go back and forth, every other chapter. There are two protagonists who live in the same city, 200 years apart. The first story causes the second one. The time lines finally came together last night. It will be very strange for me to know that Hahp and Sadima are breathing the same air, hearing the same thunder, and that, after all that has happened, they might meet. If they can both just stay alive long enough. This is the German translation. 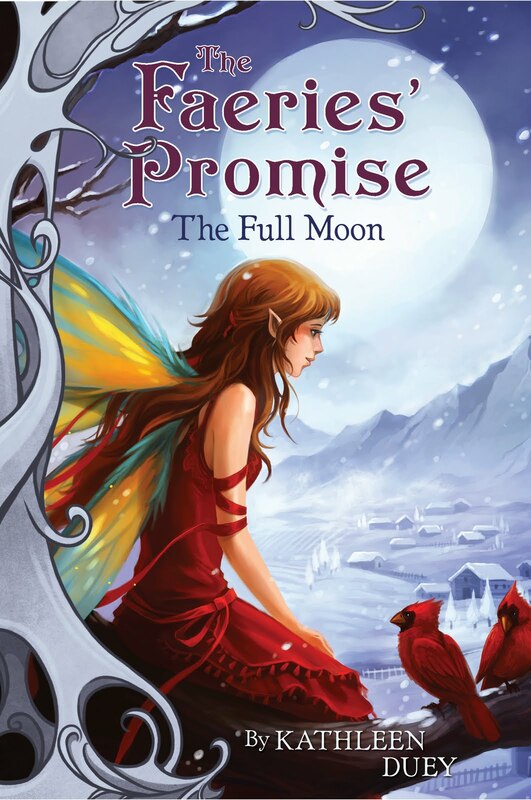 The cover art is perfect for Sadima today. She is hiding, scared, and sure of what she has to do now. I took this shot of smoke-drifts through a plane window on my way home from the amazing Baltimore Book festival last year. The instant I was on the ground I called the fire info # and was told it was on brushland and almost out. THEN I could go get my bag and wait for the shuttle. I don't think I will ever stop wondering about Limori and the people I have come to love there. Power outage last night...stopping my work abruptly. But before the lights went out, a really amazing connection between two of the characters emerged. Something I wrote in the first book suddenly made sense to me in the third book. It feels so odd when things like this happen. Like I am just a set of fingers for the characters to use as they get all this written down, sorted out, recorded accurately. 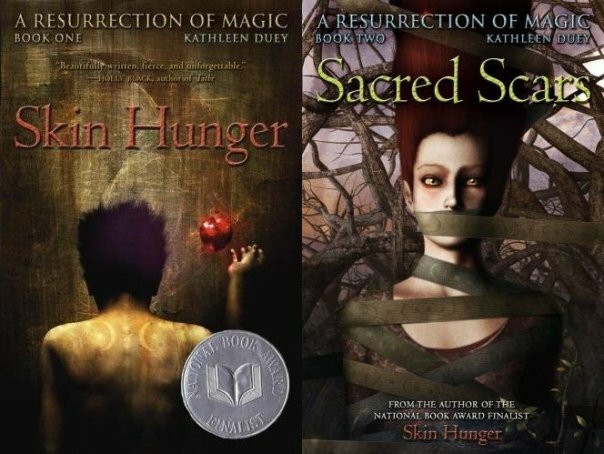 These are covers from two of my series for young readers. They both come from dreams I had in third and forth grade--incredible, vivid dreams. Every night, I would close my eyes here and wake up there. After adventures with gypsies and dragons and faeries and unicorns, I would find a place to sleep in the woods, in some friend's cottage, in a faerie's tree nest. I would go to sleep there---and open my eyes here, just in time to get ready for school. It was like having two lives. Art by Sandara Tang, who is based in Singapore. If she were closer, I would kiss her on the cheek. My writing has been interrupted for a couple of days. Back to it today. Limori feels strange to me--not because I was gone, but because things are happening in the city that I can't quite see, can't figure out. I think Somiss has passed some turning point, and has very nearly left his humanity behind. It makes me think about Hitler, Stalin, damaged people corrupted by power into thinking complete, hideous nonsense and somehow believing it. This is the everglades in Florida. The water/sky resonance is like a trance. The beauty seeps into your skin and you forget about the alligators and the water moccasins. AMAZING writing day yesterday. Hours and hours of typing fast to keep up. So many things are happening at once. 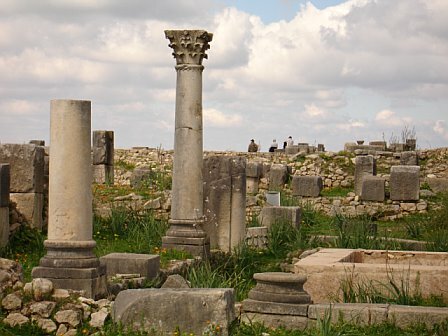 The city of Limori is dangerous now, for women, for children, for anyone walking alone. Hahp needs a way out. Sadima needs a way in. I don't think either one knows what to do now. I certainly don't.. Birds can feel the air changing, fear congealing into anger. They notice changes in pitch, in song, in everything. and they always know when it is time to flee.